Of the 35 defendants, 30 have been held in preventive detention since last July. They arrive in the courtroom handcuffed, two by two. Outside and inside, the police presence is impressive (about 40 armed policemen). In the courtroom, the defendants, mainly Africans, are located in the centre in rows. The atmosphere is tense. Opposite the defendants, are the president, the two assessor judges (all women), the prosecutor on the left, the clerk on the right. Four jurors are drawn by lot. Three people compose the observer delegation : two Dutch lawyers from the European Democratic Lawyers and a representative of Gisti and Migreurop. Next comes the reading of the charges against the defendants, summarised and translated by the five interpreters, who stand next to the defendants (French, Spanish, Farsi, English, Bambara and Wolof – the same person translates the two last languages). 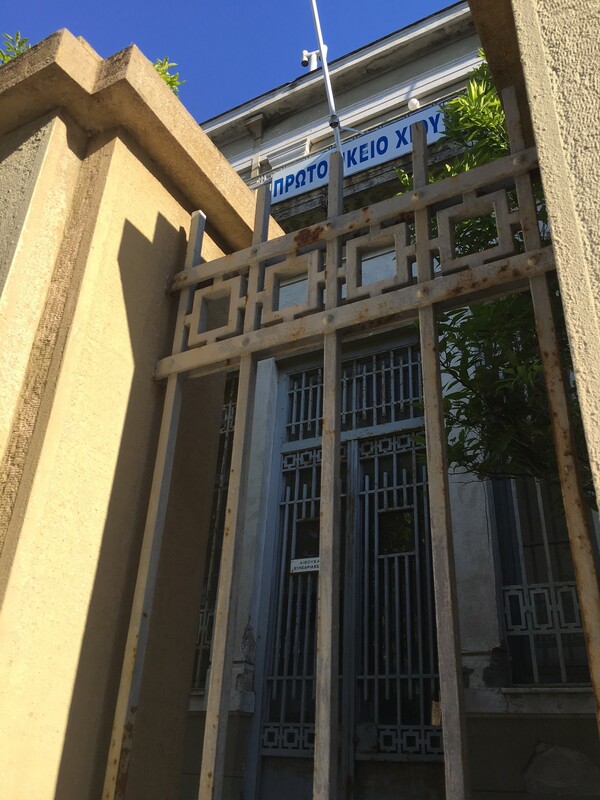 The hearing is suspended and the trial postponed to Monday, because of the absence of two defendants, held in preventive detention in Athens, who have not been brought to Chios in time. For the second day of the hearing, two more lawyers have joined the observers : one representative of Avocats sans frontières (Lawyers without Borders) and one independent English lawyer, James Nichol. The interpreters are now equipped with microphones, but the sound quality is really bad. ‘The witness [policeman] declares that he cannot precisely recognize anyone among you but he is positive you all participated to the events’ and ‘We are translating so that you can prepare your defence later’. The hearing is suspended in the middle of the afternoon without any explicit reason being given and without explanation to the defendants. 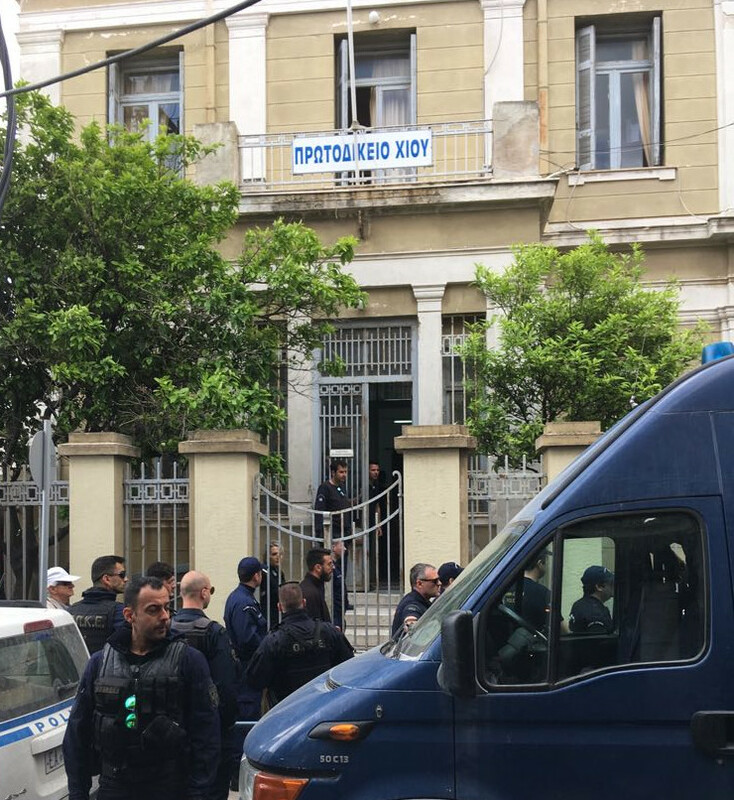 The trial resumes in the morning with the hearing of eight defence witnesses (one testimony only is translated for the defendants) and the viewing of photos and videos. Then, five defendants are heard, three declaring they did not participate in the events and one that he did not understand the translation of the interpreter into Wolof. No food has been offered from 8:00 to 15:30. According to the defence lawyers, the trial should end today or tomorrow. The verdict should follow shortly. This is the day when the defence presents its closing arguments, but also of the verdict : 26 months suspended sentence, for assault on police officers for 32 of them. They lodge an appeal.